Will US Solar Growth Continue To Shock, Explode, & Demolish Under Trump/Bannon/Pence? Solar power growth was more dramatic than almost anyone expected during the Obama administration. That was largely due to global factors — incentives in other countries that ramped up demand in those countries, a subsequent burst in manufacturing capacity (especially in China), and the dramatic drop in solar panel costs that resulted (globally). Still, the Obama administration helped to push solar at home in various ways, including via the SunShot Initiative*, and it fought for streamlined solar farm permitting & construction as well as the current federal tax credit. 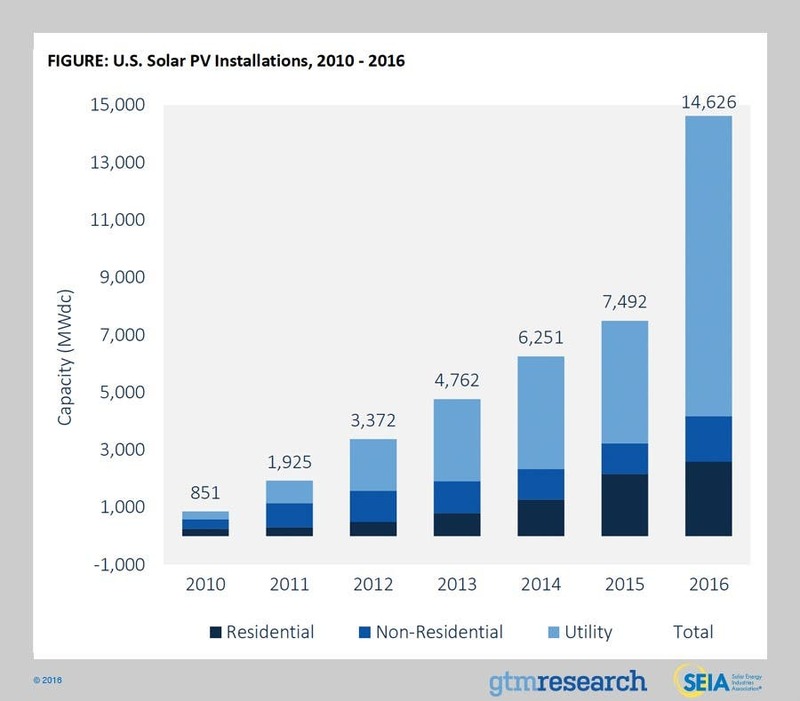 The US solar installation market exploded in part due to federal subsidies and cost reductions SunShot has helped bring the country, and US-based SunPower and First Solar have been two of the largest, most influential solar manufacturers in the world — with First Solar also being one of the largest and most competitive solar farm developers. Teasing out how much any of the Obama administration’s efforts or the federal solar tax credit contributed to US solar growth is essentially impossible. Yes, the US solar market exploded on Obama’s watch, but how much of that was due to things Obama did that Trump won’t do? Furthermore, how much was this growth due to regulations on coal or natural gas that have been pushing/keeping these dirtier options off the grid? How much will Trump’s oil & gas guys at the EPA and DOE change the game to even further favor their gas & coal cronies? This article was actually stimulated by a comment from “Yasea” sharing the following graph, which shows the global solar power trend clearly through 2013. The graph is out of date, but it is valuable in multiple ways, and what it shows has held true in more recent years as well. First of all, the most eye-catching point is that solar power capacity has exploded across the world. Additionally, the organization with the projections closest to reality has often been Greenpeace (in the US, the US Solar Energy Industries Association has also been very accurate). On the other hand, widely respected, conventional energy organizations like the International Energy Agency (IEA) and Energy Information Administration (EIA) have put out woefully pessimistic and inaccurate projections. But nobody really projected 10 years ago how fast the solar industry would actually grow. Trump’s/Bannon’s/Rick Perry’s Department of Energy might not do much to continue cutting solar soft costs via the SunShot Initiative. We really don’t have much insight on this matter yet, but nothing Trump has said or done has indicated the oil & gas guys in his Pollution Cabinet will move forward with such work. Furthermore, there is rumor that he plans to drastically cut the DOE’s budget and eliminate the Offices of Electricity, Energy Efficiency and Renewable Energy. This would fit well with Bannon’s idiotic and radical governmental ideology. However, even if the SunShot Initiative goes, it is just one piece of a big puzzle. The US federal tax credit for solar was extended at the end of 2015, with a phaseout period put in place whereby the 30% credit drops to 26% in 2020, 22% in 2021, 10% in 2022, and 0% in 2023. Talk about a lucky deal! If pollution-loving Republicans in Congress had any clue back then what was coming, I think that deal wouldn’t have gone through. It would be counterproductive on many fronts — including politically and for the USA’s general investment climate and reputation — for Trump/Bannon to try to remove the tax credit, but hey, who knows how far the anti-American ideology driving them will take this country? Solar panel prices are still basically determined globally, and continue to drop, but there is again a wildcard Trump’s/Bannon’s cronies could throw into the mix — they could put protectionist tariffs on foreign-produced solar panels and their components. That would most likely go against global trade rules and would hurt US jobs and the economy, which would be idiotic economically as well as politically. However, again, I wouldn’t put it past this administration. Such a move wouldn’t win Trump’s boys any political points beyond the fossil pollution industry, and that industry already supports the Republican Party ~100%, but it could hurt them politically with many Republican voters who love clean energy or who even have solar installation companies. But we’ll just have to wait to see whether Trump’s/Bannon’s/Pence’s administration takes such an extreme route. Note that I’m throwing Pence in here now since there’s really a decent chance he could become president in the coming few years (or months). Trump has demonstrated some “issues with reality,” and the Republican Party could legitimately decide at any time to dethrone him and stick much more smiley Mike Pence on the US celebrity throne. If that were to happen, I don’t think Bannon would be sticking around, but I have no idea where Pence would take things. Whether it’s Trump, Bannon, or Pence, it’s hard to know how far the administration will subsidize fossil fuels, let them pollute Americans to death, and cut support for renewable energy. It’s also unclear if the administration will interfere with trade policies to such a degree that we see an increase in solar panel prices. For that matter, it’s unclear at this point whether or not the Trump/Bannon/Pence administration will crash the US economy, which would certainly slow solar growth. As it stands today, unsubsidized solar and wind are cheaper than fossil fuels on average. They offer several other benefits as well, which makes a new fossil power plant nonsensical on many fronts. Additionally, when I dove into the topic last year, several industry experts expressed the expectation that solar costs will keep dropping from incremental improvements and economies of scale — with no breakthroughs needed in order to achieve more massive cost drops over the coming decades. If solar is already cheaper than everything but wind and is getting cheaper each year, it seems only logical that growth will keep flying. Though, with the US federal government and some states implementing pro-pollution policies and putting roadblocks in the way of renewable energy, we could slide backward in certain places. Back to the question at the top — “Will US solar growth continue to shock, explode, & demolish under Trump/Bannon/Pence?” — it’s hard to know at this stage how much the Republicans will do to prop up failing fossil fuel industries and try to shut out fast-growing, job-creating solar and wind energy industries. Additionally, many policies are on the state level — and that includes several utility & fossil fuel attacks on solar. However, my guess is that the administration won’t be able to do much to slow clean energy growth, and wouldn’t benefit much politically or ideologically from doing so … but I have to admit that the Trump administration has so far been even much worse and more radical than I expected. Zachary Shahan Zach is tryin' to help society help itself (and other species). He spends most of his time here on CleanTechnica as its director and chief editor. He's also the president of Important Media and the director/founder of EV Obsession and Solar Love. Zach is recognized globally as an electric vehicle, solar energy, and energy storage expert. He has presented about cleantech at conferences in India, the UAE, Ukraine, Poland, Germany, the Netherlands, the USA, and Canada. Zach has long-term investments in TSLA, FSLR, SPWR, SEDG, & ABB — after years of covering solar and EVs, he simply has a lot of faith in these particular companies and feels like they are good cleantech companies to invest in. But he offers no professional investment advice and would rather not be responsible for you losing money, so don't jump to conclusions.